Home/Blog / Am I a Candidate for Arm Lift Surgery? Overall, people are making efforts these days to live healthier lifestyles. However, as some exercise and lose weight, they may notice their arms not taking on a desirable shape. The appearance of loose, excess skin on the arms that remains resistant to diet and exercise is bothersome for many, and it often leads to insecurities and feelings of self-consciousness about wearing short sleeves or blouses. During the past year, we have noticed quite an increase in the number of consultations for patients interested in treating their arms, which we believe can be attributed to patients leading healthier lifestyles and researching various solutions to their concerns. 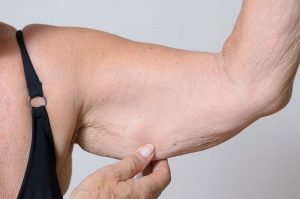 While some patients desire contouring of the arms using liposuction, others seek a more dramatic result and wish to speak with Dr. Cobbins or Dr. Braithwaite about arm lift surgery. Medically referred to as brachioplasty, arm lift surgery is a procedure designed to remove excess skin and fat from the upper arm while also tightening loose, sagging skin for a more aesthetically-pleasing contour. In many instances, liposuction can also be combined with the operation to enhance the final outcome. If you are interested in arm lift surgery and wish to schedule a consultation with Dr. Braithwaite or Dr. Cobbins, please contact The Aesthetic Institute of Chicago today.